Used for the purpose of duplex printing by laser printer. The show-through is OK level and whiteness is also wonderful. This review is about item#6344904. I use it every time, but I can use printout without problems. But! When copying with a printer, the white part becomes gray. This review is about item#6344913. I am very satisfied with paper thickness, coloring, price. (Monotaro's price is wonderful and conscientious and it is very helpful.) Thank you very much! By the way, I was accidentally inadvertently making arrangements and inevitably went to the shop, and it was told that this part number is no longer being manufactured . Is that so? Since I'd like to continue using it for the future, I hope that it will not be discontinued. This review is about item#06344904. I was looking for thick plain paper. Canon's inkjet printer is used, but you can print on both sides cleanly. I think that this print quality is not other products at this price. This review is about item#06344913. 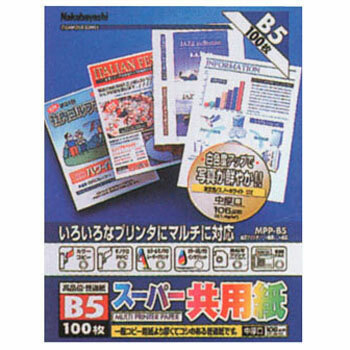 I was looking for paper that can be printed on both sides with B 5, I found a super-shared paper. There was a paper with a little more thickness in other companies, but I stopped because the price was quite high. Although it is used to create monthly report that put pictures in inkjet printer, color printing can be done so much, even when printing on both sides, there is little show-through, and it is handy. We are printing with a laser printer, but we are using it with satisfactory whiteness and thickness. Where you can use both sides is good. I am using it satisfied with the price.